Citroen C4 C4 PICASSO C5 XSARA XSARA II XSARA PICASSO. 2 Years Warranty Nissens Oil Cooler, engine oil. RADIATORS NISSENS. PEUGEOT 308 SW II 1.2 THP 130. OIL FILTER. QUALITY BRAKE DISCS PAIR. Car Parts - To avoid any delay in processing the order. Product image is for illustration purposes only and may be different from the item you receive. Scheinwerfer Reparatursatz. Tuning Scheinwerfer. Xenon Scheinwerfer. Lackierte Scheinwerferblende. der Identifikation der Fahrzeuge und - oder Fahrzeugtypen. Alle Angaben ohne Gewähr. CITROËN C3 I (FC_) 1.6 16V Schrägheck 80 KW 1587 ccm 02.2002 -> 3001-789 / 3001-AAQ Baujahr bis:04/2005. Oil Cooler 31308 NRF. Part Number 31308. Function Oil Cooler, engine oil. Cooling Type Water-cooled. AVA QUALITY COOLING PE3400, PE3400H. PEUGEOT BOXER Platform/Chassis 2.2 HDi 130 Platform/Chassis Diesel 03/2011 on FWD 16 131 96. CITROËN 1103P4, 1103P5, 1451593, 1492022, 6G9Q6L625AB, 6G9Q6L625AC. PEUGEOT 1103P4, 1103P5. for OE No. : 1103P4. Oil Cooler 31313 NRF. Part Number 31313. Function Oil Cooler, engine oil. Cooling Type Water-cooled. Nissens Oil Cooler, engine oil 90701 Replaces 1103. Oil Coolers Engine and transmission oil cooling Oil applied for lubrication plays a significant cooling role. It is typically the automatic gearbox oil that needs a dedicated oil cooler. 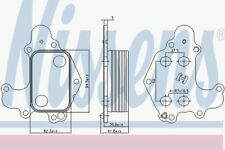 Oil Cooler - Nissens 90990. Part Number: 90990. (We can mark the item as a 'gift' if requested to, but we will not declare any different amount). Engine Cooling. Product Attributes/Specifics OE Reference: 1103V1. Nissens has specialized in manufacturing and supplying radiators and condensers for the automotive aftermarket. Nissens' product range covers most of the models from the world's 30 leading car manufacturers. Nissens is recognized as an OES/OEM supplier to for instance PSA, SAAB, Fiat, Mazda, VW, Toyota, Honda, Scania, Lamborghini and Aston Martin. With a range of more than 10,000 products, Nissens has the broadest product range in the market. Part No: 90701. Height(mm) : 98. Oil coolers. THE WIDEST PRODUCT RANGE. • Deep coverage of more than 90% of all market applications. Rice Rocket. Nissens Oil Cooler, engine oil 90740 Replaces OE. Oil Coolers Engine and transmission oil cooling Oil applied for lubrication plays a significant cooling role. It is typically the automatic gearbox oil that needs a dedicated oil cooler. Part No: 90670. Oil coolers. THE WIDEST PRODUCT RANGE. • Deep coverage of more than 90% of all market applications. Rice Rocket. Part No: 90740. • Deep coverage of more than 90% of all market applications. Oil coolers. THE WIDEST PRODUCT RANGE. • Up to 30 new products launched each month. Belt Tensioner Wheels & Bkts. Suspension Ball Joints. Oil Cooler. Rear Lights. Front Exhausts Cats. Estimates can be provided beforehand but prices may differ upon ordering. Engine Code. The compatibility is only a guide. For Manual Transmission. For following engine codes. Length [mm] : 591. CITROËN 1174. CITROËN 1174.84. Part No: 90703. Oil coolers. THE WIDEST PRODUCT RANGE. • Deep coverage of more than 90% of all market applications. Rice Rocket. 2 Years Warranty Nissens Oil Cooler, engine oil. RADIATORS NISSENS. PEUGEOT BOXER 2.2 HDi 110. APEC BRAKE MASTER CYLINDER. OIL FILTER. QUALITY BRAKE DISCS PAIR. Car Parts - To avoid any delay in processing the order. Belt Tensioner Wheels & Bkts. Suspension Ball Joints. Oil Cooler. Version: only Cooler unit. Rear Lights. Front Exhausts Cats. Estimates can be provided beforehand but prices may differ upon ordering. Oil Coolers Engine and transmission oil cooling Oil applied for lubrication plays a significant cooling role. It is typically the automatic gearbox oil that needs a dedicated oil cooler. Especially in high-performing or downsized engine vehicles, a dedicated oil cooler is an important part of the system. Belt Tensioner Wheels & Bkts. Suspension Ball Joints. Oil Cooler. Rear Lights. Front Exhausts Cats. Estimates can be provided beforehand but prices may differ upon ordering. The compatibility is only a guide. Nissens Oil Cooler, engine oil 90670 Replaces 166007N,8MO376797101,07034002,7034002,421M50A,31174. Oil Coolers Engine and transmission oil cooling Oil applied for lubrication plays a significant cooling role. Belt Tensioner Wheels & Bkts. Suspension Ball Joints. Specification: ONLY OIL COOLER UNIT. Oil Cooler. Rear Lights. Front Exhausts Cats. Estimates can be provided beforehand but prices may differ upon ordering. PEUGEOT 5008 2 HDi 136 / BlueHDi 136. 2 Years Warranty Nissens Oil Cooler, engine oil. RADIATORS NISSENS. OIL FILTER. QUALITY BRAKE DISCS PAIR. Car Parts - To avoid any delay in processing the order. Engine Oil Cooler - Nissens 90703. Part Number: 90703. Notes : ENGINE. Engine Parts. Engine Cooling. (We can mark the item as a 'gift' if requested to, but we will not declare any different amount). OE Reference: 1103 N9. Engine Oil Cooler - Nissens 90670. Part Number: 90670. ENGINE ONLY OIL COOLER UNIT. Notes : ENGINE | ONLY OIL COOLER UNIT. Engine Parts. Engine Cooling. (We can mark the item as a 'gift' if requested to, but we will not declare any different amount). CITROËN C3 I (FC_) 1.6 16V Schrägheck 80 KW 1587 ccm 02.2002 -> 3001-789 / 3001-AAQ Baujahr bis:04/2005. Scheinwerfer Reparatursatz. Tuning Scheinwerfer. Xenon Scheinwerfer. Lackierte Scheinwerferblende. Scheinwerfer Reparatursatz. Tuning Scheinwerfer. Xenon Scheinwerfer. Lackierte Scheinwerferblende. Wo ist die KBA?. der Identifikation der Fahrzeuge und - oder Fahrzeugtypen. Alle Angaben ohne Gewähr. Part Number: 31313. (We can mark the item as a 'gift' if requested to, but we will not declare any different amount). Automotive Parts. Office Supplies. Engine Oil Cooler - Nissens 90740. Part Number: 90740. ENGINE ONLY OIL COOLER UNIT. Notes : ENGINE | ONLY OIL COOLER UNIT. Engine Parts. Engine Cooling. (We can mark the item as a 'gift' if requested to, but we will not declare any different amount). Engine Oil Cooler - Nissens 90701. Part Number: 90701. Notes : ENGINE. Engine Parts. Engine Cooling. (We can mark the item as a 'gift' if requested to, but we will not declare any different amount). OE Reference: 1103. Nissens PEUGEOT 206 Oil Cooler 90701 1.9 ltr 08/98-01/00. 2 Year Manufacturer Warranty Nissens Oil Cooler. RADIATORS NISSENS. PEUGEOT 206 (2A/C) 1.9 D. APEC BRAKE DISC & PADS KIT. BOSCH IGNITION & FUEL PARTS. 90670 - OIL COOLER - NIS90670. Gross weight ONLY OIL COOLER UNIT. 94 x 62 x 42 mm. 140 x 115 x 95 mm. Nissens FORD FIESTA Oil Cooler 90703 1.4 ltr 06/08-01/00. 2 Year Manufacturer Warranty Nissens Oil Cooler. RADIATORS NISSENS. FORD FIESTA VI 1.4 TDCi. APEC BRAKE DISC & PADS KIT. BOSCH IGNITION & FUEL PARTS. Nissens VOLVO S40 Oil Cooler 90670 1.6 ltr 01/04-01/00. 2 Year Manufacturer Warranty Nissens Oil Cooler. RADIATORS NISSENS. VOLVO S40 II (MS) 1.6 D2. APEC BRAKE DISC & PADS KIT. BOSCH IGNITION & FUEL PARTS.